ন-কৈ উপজা কুলিয়ে আন চৰাইৰ কণী আৰু পোৱালি সঁজাৰ বাহিৰলৈ পেলাই দিয়া কথাটো (আগতে প্ৰাপ্তবয়স্ক কুলিয়ে এনে কৰে বুলি ভবা হৈছিল) ফটোগ্ৰাফী পোৱাৰ পিছত বিংশ শতিকাতহে নিশ্চিত হৈছিল। Having observed this behaviour, Jenner demonstrated an anatomical adaptation for it—the baby cuckoo has a depression in its back, not present after 12 days of life, that enables it to cup eggs and other chicks. The adult does not remain long enough in the area to perform this task. Jenner's findings were published in Philosophical Transactions of the Royal Society in 1788. Jenner's nephew assisted in the study. Jenner married Catherine Kingscote (died 1815 from tuberculosis) in March 1788 after meeting her while he and other Fellows were experimenting with balloons. Jenner's trial balloon descended into Kingscote Park, Gloucestershire, owned by Anthony Kingscote, one of whose daughters was Catherine. Jenner earned his MD from the University of St Andrews in 1792. Jenner is also credited with advancing understanding of angina pectoris. In his correspondence with Heberden, he wrote, "How much the heart must suffer from the coronary arteries not being able to perform their functions." In 1765, Dr John Fewster published a paper in the London Medical Society entitled "Cow pox and its ability to prevent smallpox", but he did not pursue the subject further. In the years following 1770, at least five investigators in England and Germany (Sevel, Jensen, Jesty 1774, Rendell, Plett 1791) successfully tested a cowpox vaccine in humans against smallpox. For example, Dorset farmer Benjamin Jesty successfully vaccinated and presumably induced immunity with cowpox in his wife and two children during a smallpox epidemic in 1774, but it was not until Jenner's work some 20 years later that the procedure became widely understood. Indeed, Jenner may have been aware of Jesty's procedures and success. Noting the common observation that milkmaids were generally immune to smallpox, Jenner postulated that the pus in the blisters that milkmaids received from cowpox (a disease similar to smallpox, but much less virulent) protected them from smallpox. He may already have heard of Benjamin Jesty's success. Donald Hopkins has written, "Jenner's unique contribution was not that he inoculated a few persons with cowpox, but that he then proved [by subsequent challenges] that they were immune to smallpox. Moreover, he demonstrated that the protective cowpox pus could be effectively inoculated from person to person, not just directly from cattle. Jenner successfully tested his hypothesis on 23 additional subjects. Jenner continued his research and reported it to the Royal Society, which did not publish the initial paper. After revisions and further investigations, he published his findings on the 23 cases. Some of his conclusions were correct, some erroneous; modern microbiological and microscopic methods would make his studies easier to reproduce. The medical establishment, cautious then as now, deliberated at length over his findings before accepting them. Eventually, vaccination was accepted, and in 1840, the British government banned variolation – the use of smallpox – and provided vaccination – using cowpox – free of charge. (See Vaccination acts). The success of his discovery soon spread around Europe and, for example, was used en masse in the Spanish Balmis Expedition, a three-year-long mission to the Americas, the Philippines, Macao, China, and Saint Helena Island led by Dr. Francisco Javier de Balmis with the aim of giving thousands the smallpox vaccine. The expedition was successful, and Jenner wrote, "I don’t imagine the annals of history furnish an example of philanthropy so noble, so extensive as this." 1802 caricature of Jenner vaccinating patients who feared it would make them sprout cowlike appendages. Jenner's continuing work on vaccination prevented him continuing his ordinary medical practice. He was supported by his colleagues and the King in petitioning Parliament, and was granted £10,000 for his work on vaccination. In 1806, he was granted another £20,000 for his continuing work in microbiology. 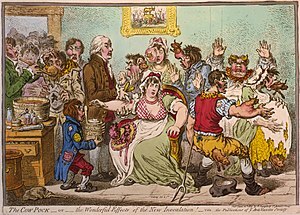 In 1803 in London, he became involved with the Jennerian Institution, a society concerned with promoting vaccination to eradicate smallpox. In 1808, with government aid, this society became the National Vaccine Establishment. Jenner became a member of the Medical and Chirurgical Society on its founding in 1805 and presented a number of papers there. The society is now the Royal Society of Medicine. In 1806, Jenner was elected a foreign member of the Royal Swedish Academy of Sciences. Returning to London in 1811, Jenner observed a significant number of cases of smallpox after vaccination. He found that in these cases the severity of the illness was notably diminished by previous vaccination. In 1821, he was appointed Physician Extraordinary to King George IV, a great national honour, and was also made Mayor of Berkeley and Justice of the Peace. He continued to investigate natural history, and in 1823, the last year of his life, he presented his "Observations on the Migration of Birds" to the Royal Society. Jenner was found in a state of apoplexy on 25 January 1823, with his right side paralysed. He never fully recovered and eventually died of an apparent stroke, his second, on 26 January 1823, aged 73. He was survived by one son and one daughter, his elder son having died of tuberculosis at the age of 21. In 1979, the World Health Organization declared smallpox an eradicated disease. This was the result of coordinated public health efforts by many people, but vaccination was an essential component. And although the disease was declared eradicated, some pus samples still remain in laboratories in Centers for Disease Control and Prevention in Atlanta, Georgia, in the United States and State Research Center of Virology and Biotechnology VECTOR in Koltsovo, Novosibirsk Oblast, Russia. Jenner's vaccine also laid the foundation for contemporary discoveries in immunology, and the field he began may someday lead to cures for arthritis, AIDS, and many other diseases. An illustrated history of smallpox eradication, Smallpox Zero, was published with the support of Sanofi Pasteur and distributed on 17 May 2010, in Geneva during an event sponsored by the World Health Organization. Smallpox Zero includes President Thomas Jefferson's letter of congratulations to Edward Jenner. In 2002, Jenner was named in the BBC's list of the 100 Greatest Britons following a UK-wide vote. The lunar crater Jenner is named in his honor. Edward Jenner is buried in the Jenner family vault at the Church of St. Mary's, Berkeley. A section at Gloucestershire Royal Hospital is known as the Edward Jenner Ward; it is where blood is drawn. Jenner Gardens at Cheltenham, Gloucestershire, opposite one of the scientist's former offices, is a small garden and cemetery outside the walls of the upper town of Boulogne sur Mer, France. In The Henry Cort Community College, Fareham, Hampshire, a building is named after him. The Walking Dead television series's character Edwin Jenner, a doctor affiliated with Atlanta's Centers for Disease Control, is a homage to Edward Jenner. ↑ Stefan Riedel, MD, PhD (January 2005). Edward Jenner and the history of smallpox and vaccination. 18. Baylor University Medical Center. pp. 21–25. PMID 16200144. ↑ "Edward Jenner - (1749–1823)". Sundaytimes.lk. 1 June 2008. http://sundaytimes.lk/080601/FunDay/famous.html। আহৰণ কৰা হৈছে: 28 July 2009. ↑ "History - Edward Jenner (1749 - 1823)". BBC. 1 November 2006. http://www.bbc.co.uk/history/historic_figures/jenner_edward.shtml। আহৰণ কৰা হৈছে: 28 July 2009. ↑ "Edward Jenner - Smallpox and the Discovery of Vaccination". http://www.dinweb.org/dinweb/DINMuseum/Edward%20Jenner.asp। আহৰণ কৰা হৈছে: 28 July 2009. ↑ "About Edward Jenner". The Jenner Institute. http://www.jenner.ac.uk/edwardjenner। আহৰণ কৰা হৈছে: 25 February 2012. ↑ 7.0 7.1 "About Edward Jenner". The Jenner Institute. http://www.jenner.ac.uk/edwardjenner। আহৰণ কৰা হৈছে: 12 January 2013. ↑ "Young Edward Jenner, Born in Berkeley". Edward Jenner Museum. http://www.jennermuseum.com/Jenner/youngedward.html। আহৰণ কৰা হৈছে: 4 September 2012. ↑ Loncarek K (April 2009). "Revolution or reformation". Croatian Medical Journal খণ্ড 50 (2): 195–7. doi:10.3325/cmj.2009.50.195. PMID 19399955. ↑ François Marie Arouet de Voltaire (1778). "Letters on the English or Lettres Philosophiques". http://www.fordham.edu/halsall/mod/1778voltaire-lettres.asp#Letter%20XI. ↑ "Voltaire on Circassian Medicine: Inoculation". Circassian World. http://www.circassianworld.com/new/history/miscelleneous/1202-circassian-medicine.html. from Voltaire (1733). The Works of Voltaire. Vol. XIX (Philosophical Letters). ↑ Plett PC (2006). "Peter Plett and other discoverers of cowpox vaccination before Edward Jenner [Peter Plett and other discoverers of cowpox vaccination before Edward Jenner]" (German ভাষাত). Sudhoffs Archiv খণ্ড 90 (2): 219–32. PMID 17338405. ↑ Hammarsten J. F. et al. (1979). "Who discovered smallpox vaccination? Edward Jenner or Benjamin Jesty?". Transactions of the American Clinical and Climatological Association খণ্ড 90: 44–55. PMID 390826. ↑ Grant, John (2007). Corrupted Science: Fraud, Ideology and Politics in Science. প্ৰকাশক London: Facts, Figures & Fun. পৃষ্ঠা. 24. ISBN 978-1-904332-73-2. ↑ Hopkins, Donald R. (2002). The greatest killer: smallpox in history, with a new introduction. প্ৰকাশক Chicago: University of Chicago Press. পৃষ্ঠা. 80. ISBN 978-0-226-35168-1. OCLC 49305765. ↑ Carlos Franco-Paredes, Lorena Lammoglia, and José Ignacio Santos-Preciado (2005). The Spanish Royal Philanthropic Expedition to Bring Smallpox Vaccination to the New World and Asia in the 19th Century. 41. Clinical Infectious Diseases. pp. 1285–1289. doi:10.1086/496930. http://cid.oxfordjournals.org/content/41/9/1285.full. ↑ World Health Organization (2001). "Smallpox". http://www.who.int/mediacentre/factsheets/smallpox/en/index.html. ↑ "Dr. Edward Jenner and the small pox vaccination". Essortment.com. http://www.essortment.com/all/edwardjennersm_rmfk.htm। আহৰণ কৰা হৈছে: 28 July 2009. ↑ "Smallpox Zero". African Comic Production House, Johannesburg, South Africa. ISBN 978-0-620-43765-3. http://www.avpi.org/statics/flipbooks/SmallpoxEN/sources/. ↑ "100 great Britons - A complete list". Daily Mail. 21 August 2002. http://www.dailymail.co.uk/news/article-134458/100-great-Britons--A-complete-list.html। আহৰণ কৰা হৈছে: 2 August 2012. ↑ "Edward Jenner - St Mary's Church, Berkeley, Gloucestershire". http://www.stmarys-berkeley.co.uk/history/60-edward-jenner। আহৰণ কৰা হৈছে: 2010-12-15. ↑ Royal College of Physicians. "JENNER, Edward (1749-1750)". AIM25 Archives. http://www.aim25.ac.uk/cgi-bin/search2?coll_id=7135&inst_id=8. ↑ St George's, University of London. "Our History". http://www.stgeorges.nhs.uk/aboutourhistory.asp. ↑ Edward Jenner. (1909–14.). "An Inquiry Into the Causes and Effects of the Variolæ Vaccinæ, Or Cow-Pox. 1798". The Harvard Classics. http://www.bartleby.com/38/4/1.html. ↑ Edward Jenner. (1909–14.). "Further Observations on the Variolæ Vaccinæ, or Cow-Pox. 1799". The Harvard Classics. http://www.bartleby.com/38/4/1.html. ↑ Edward Jenner. (1909–14.). "A Continuation of Facts and Observations Relative to the Variolæ Vaccinæ, or Cow-Pox. 1800". The Harvard Classics. http://www.bartleby.com/38/4/3.html. Cartwright K (October 2005). "From Jenner to modern smallpox vaccines". Occupational Medicine খণ্ড 55 (7): 563–563. doi:10.1093/occmed/kqi163. PMID 16251374. Riedel S (January 2005). "Edward Jenner and the history of smallpox and vaccination". Proceedings খণ্ড 18 (1): 21–5. PMID 16200144. Tan SY (November 2004). "Edward Jenner (1749-1823): conqueror of smallpox". Singapore Medical Journal খণ্ড 45 (11): 507–8. PMID 15510320. http://www.sma.org.sg/smj/4511/4511ms1.pdf. van Oss CJ (November 2000). "Inoculation against smallpox as the precursor to vaccination". Immunological Investigations খণ্ড 29 (4): 443–6. PMID 11130785. Gross CP, Sepkowitz KA (1998). "The myth of the medical breakthrough: smallpox, vaccination, and Jenner reconsidered". International Journal of Infectious Diseases খণ্ড 3 (1): 54–60. doi:10.1016/S1201-9712(98)90096-0. PMID 9831677. Willis NJ (August 1997). "Edward Jenner and the eradication of smallpox". Scottish Medical Journal খণ্ড 42 (4): 118–21. PMID 9507590. Theves G (1997). "Smallpox: an historical review [Smallpox: an historical review]" (German ভাষাত). Bulletin De La Société Des Sciences Médicales Du Grand-Duché De Luxembourg খণ্ড 134 (1): 31–51. PMID 9303824. Kempa ME (December 1996). "Edward Jenner (1749-1823)--benefactor to mankind (100th anniversary of the first vaccination against smallpox) [Edward Jenner (1749-1823)--benefactor to mankind (100th anniversary of the first vaccination against smallpox)]" (Polish ভাষাত). Polski Merkuriusz Lekarski খণ্ড 1 (6): 433–4. PMID 9273243. Baxby D (November 1996). "The Jenner bicentenary: the introduction and early distribution of smallpox vaccine". FEMS Immunology and Medical Microbiology খণ্ড 16 (1): 1–10. doi:10.1111/j.1574-695X.1996.tb00105.x. PMID 8954347. Larner AJ (September 1996). "Smallpox". The New England Journal of Medicine খণ্ড 335 (12): 901; author reply 902. PMID 8778627. Aly A, Aly S (September 1996). "Smallpox". The New England Journal of Medicine খণ্ড 335 (12): 900–1; author reply 902. doi:10.1056/NEJM199609193351217. PMID 8778626. Magner J (September 1996). "Smallpox". The New England Journal of Medicine খণ্ড 335 (12): 900–902. doi:10.1056/NEJM199609193351217. PMID 8778624. Kumate-Rodríguez J (1996). "Bicentennial of smallpox vaccine: experiences and lessons [Bicentennial of smallpox vaccine: experiences and lessons]" (Spanish ভাষাত). Salud Pública De México খণ্ড 38 (5): 379–85. PMID 9092091. Budai J (August 1996). "200th anniversary of the Jenner smallpox vaccine [200th anniversary of the Jenner smallpox vaccine]" (Hungarian ভাষাত). Orvosi Hetilap খণ্ড 137 (34): 1875–7. PMID 8927342. Rathbone J (June 1996). "Lady Mary Wortley Montague's contribution to the eradication of smallpox". Lancet খণ্ড 347 (9014): 1566. doi:10.1016/S0140-6736(96)90724-2. PMID 8684145. Baxby D (June 1996). "The Jenner bicentenary; still uses for smallpox vaccine". Epidemiology and Infection খণ্ড 116 (3): 231–4. doi:10.1017/S0950268800052523. PMID 8666065. Cook GC (May 1996). "Dr William Woodville (1752-1805) and the St Pancras Smallpox Hospital". Journal of Medical Biography খণ্ড 4 (2): 71–8. PMID 11616267. Baxby D (1996). "Jenner and the control of smallpox". Transactions of the Medical Society of London খণ্ড 113: 18–22. PMID 10326082. Dunn PM (January 1996). "Dr Edward Jenner (1749-1823) of Berkeley, and vaccination against smallpox". Archives of Disease in Childhood খণ্ড 74 (1): F77–8. doi:10.1136/fn.74.1.F77. PMID 8653442. PMC 2528332. http://fn.bmj.com/cgi/pmidlookup?view=long&pmid=8653442. Meynell E (August 1995). "French reactions to Jenner's discovery of smallpox vaccination: the primary sources". Social History of Medicine খণ্ড 8 (2): 285–303. doi:10.1093/shm/8.2.285. PMID 11639810. Bloch H (July 1993). "Edward Jenner (1749-1823). The history and effects of smallpox, inoculation, and vaccination". American Journal of Diseases of Children খণ্ড 147 (7): 772–4. PMID 8322750. Roses DF (October 1992). "From Hunter and the Great Pox to Jenner and smallpox". Surgery, Gynecology & Obstetrics খণ্ড 175 (4): 365–72. PMID 1411896. Turk JL, Allen E (April 1990). "The influence of John Hunter's inoculation practice on Edward Jenner's discovery of vaccination against smallpox". Journal of the Royal Society of Medicine খণ্ড 83 (4): 266–7. PMID 2187990. Poliakov VE (December 1985). "Edward Jenner and vaccination against smallpox [Edward Jenner and vaccination against smallpox]" (Russian ভাষাত). Meditsinskaia Sestra খণ্ড 44 (12): 49–51. PMID 3912642. Hammarsten JF, Tattersall W, Hammarsten JE (1979). "Who discovered smallpox vaccination? Edward Jenner or Benjamin Jesty?". Transactions of the American Clinical and Climatological Association খণ্ড 90: 44–55. PMID 390826. Rodrigues BA (1975). "Smallpox eradication in the Americas". Bulletin of the Pan American Health Organization খণ্ড 9 (1): 53–68. PMID 167890. Wynder EL (March 1974). "A corner of history: Jenner and his smallpox vaccine". Preventive Medicine খণ্ড 3 (1): 173–5. doi:10.1016/0091-7435(74)90074-7. PMID 4592685. Andreae H (June 1973). "Edward Jenner, initiator of cowpox vaccination against human smallpox, died 150 years ago [Edward Jenner, initiator of cowpox vaccination against human smallpox, died 150 years ago]" (German ভাষাত). Das Offentliche Gesundheitswesen খণ্ড 35 (6): 366–7. PMID 4269783. Friedrich I (February 1973). "A cure for smallpox. On the 150th anniversary of Edward Jenner's death [A cure for smallpox. On the 150th anniversary of Edward Jenner's death]" (Hungarian ভাষাত). Orvosi Hetilap খণ্ড 114 (6): 336–8. PMID 4567814. MacNalty AS (January 1968). "The prevention of smallpox: from Edward Jenner to Monckton Copeman". Medical History খণ্ড 12 (1): 1–18. PMID 4867646. Udovitskaia EF (November 1966). "Edward Jenner and the history of his scientific achievement. (On the 170th anniversary of the discovery of smallpox vaccination) [Edward Jenner and the history of his scientific achievement. (On the 170th anniversary of the discovery of smallpox vaccination)]" (Russian ভাষাত). Vrachebnoe Delo খণ্ড 11: 111–5. PMID 4885910. Voigt K (1964). "THE PHARMACY DISPLAY WINDOW. EDWARD JENNER DISCOVERED SMALLPOX VACCINATION [The Pharmacy Display Window. Edward Jenner Discovered Smallpox Vaccination]" (German ভাষাত). Pharmazeutische Praxis খণ্ড 106: 88–9. PMID 14237138.